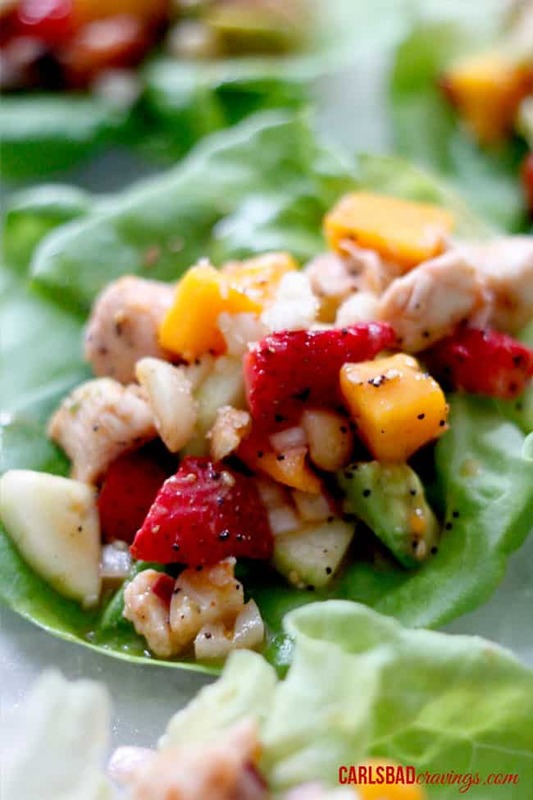 These Poppy Seed Chicken Fruit Lettuce Wraps are sweet, creamy, crunchy and PACKED with flavor! You prep the filling ahead of time to chill making these wraps an easy make ahead lunch or party appetizer! Guys, these are goooooood! I feel silly telling you this again so soon because you are going to think I have absolutely no self control, but I was eating this chilled fruit/chicken filling straight from the fridge, I just couldn’t wait for pictures. But you can’t blame me, right? 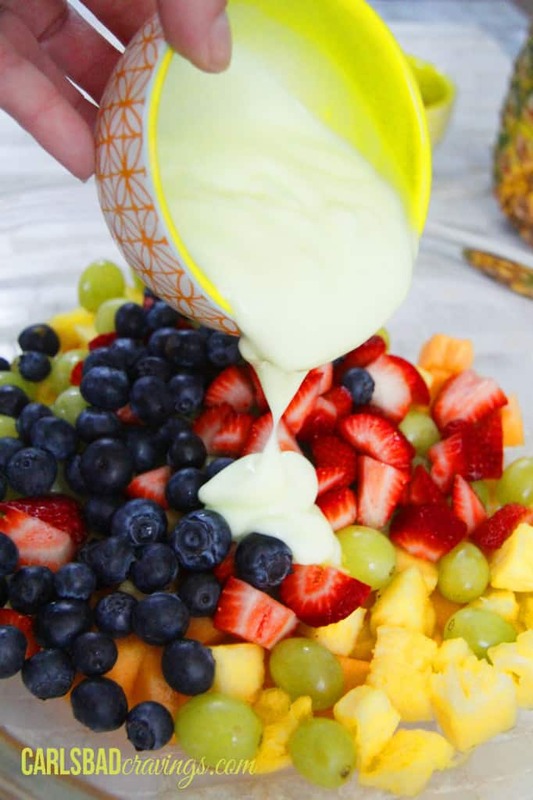 Because these bright, fresh, colorful, cheery wraps with the most delectable, sweet, tangy poppy seed dressing to ever grace your lips just look like summer. And we all know summer is irresistible. We look forward to summer, love summer, CAN’T GET ENOUGH summer. 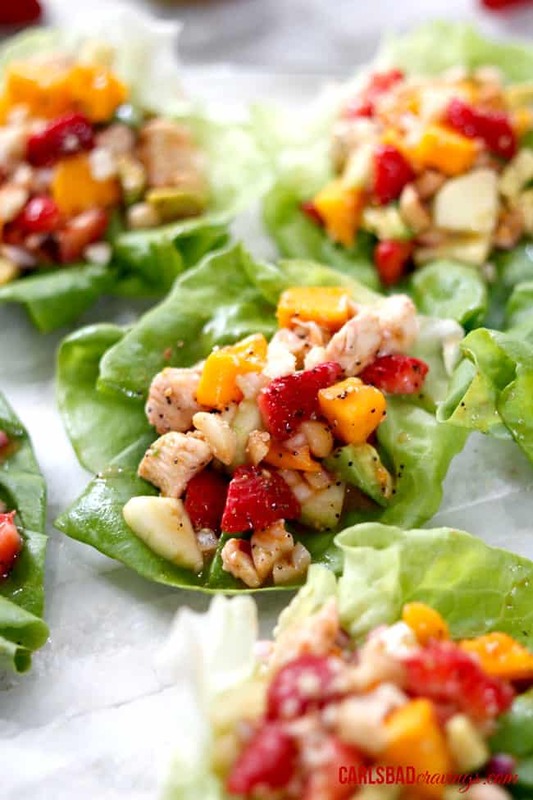 And so it is with these Poppy Seed Chicken Fruit Salad Lettuce Wraps! My entire inspiration behind these wraps is the exquisite poppy seed dressing, all made possible because of my sister. So remember when I told you about my amazing sister in my Baked Sweet and Sour Chicken post? About how she is the most giving and talented sister ever – giving me my first recipe binder full of her tried and true favorite recipes that she personally typed up for Christmas, and how she gave me her kidney last October? Well, in that binder was a Strawberry Spinach Salad with Poppy Seed Dressing. 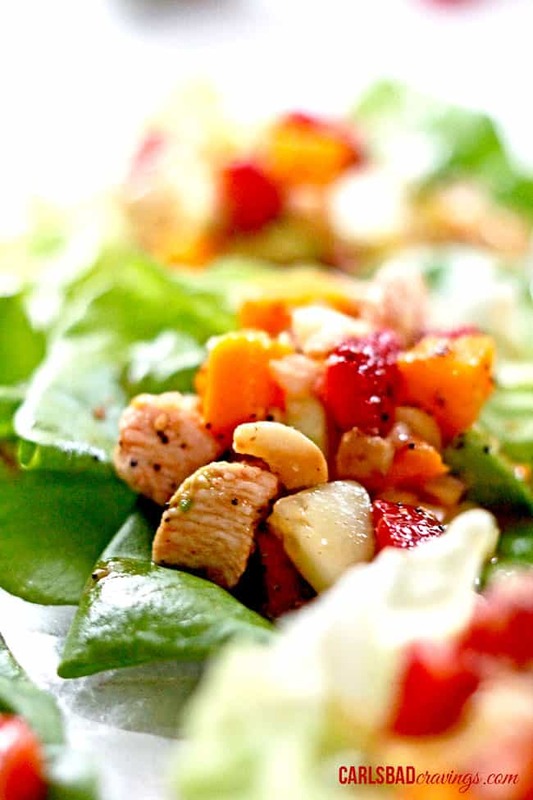 It quickly became my favorite salad recipe of hers and I would be asked for the salad recipe wherever I brought it, largely due to the dressing. With a few modifications, this dressing boasts poppy seeds, sesame seeds, minced onion, lemon juice, sugar, cider vinegar, a dash of Worchestershire sauce and paprika for just a kick. I decided to make lettuce wraps using this dressing because my favorite part of any salad is always everything besides the lettuce, so I stuffed the wraps with my some of my favorite summer ingredients – strawberries, mangos, cucumber, and avocado, which all marinate/chill in the dressing along with the marinated and cooked chicken so they seep with flavor. And if you are intimidated by cutting mangos – do’t be, just check out my How to Cut A Mango Post that teaches everything you could ever want to know about mangos! 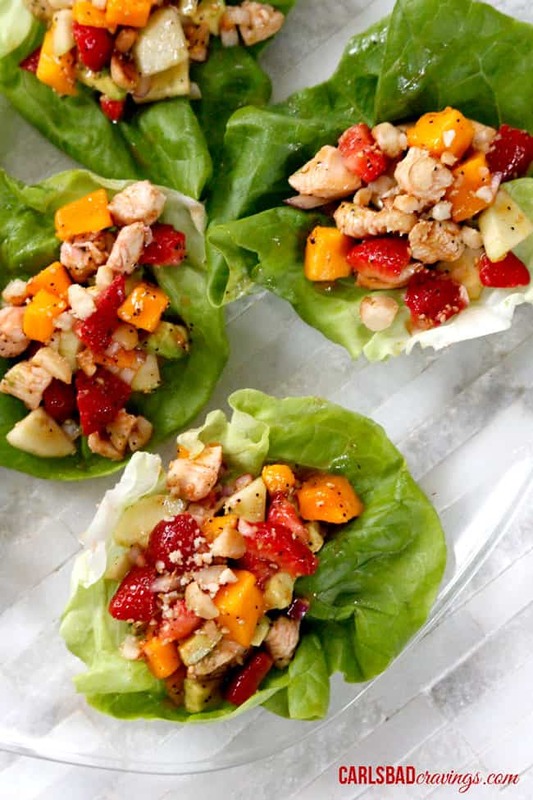 Wrap the chilled filling in a cocoon of fresh, crispy butter lettuce, top with roasted macadamia nuts and top again with toasted coconut if you wish, and you have fresh, sweet, creamy, crunchy flavor PACKED bites of summer. 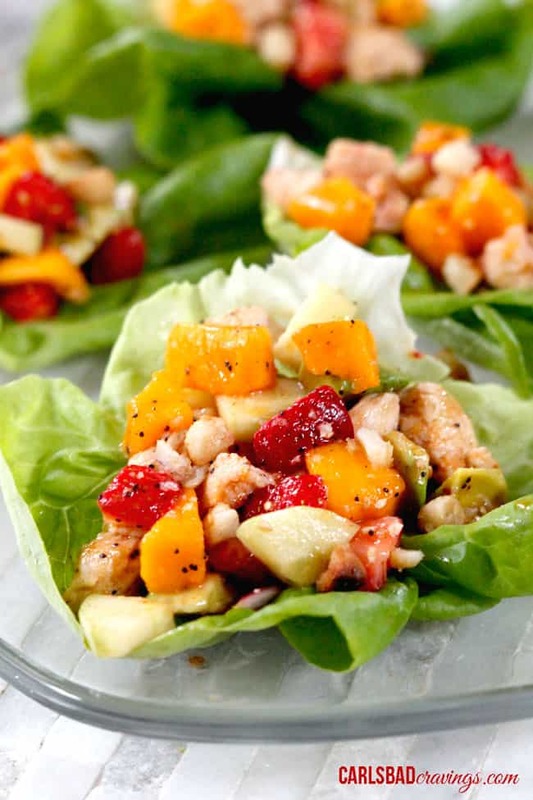 With Poppy Seed Chicken Fruit Salad Lettuce Wraps you can have a taste of summer almost year round! 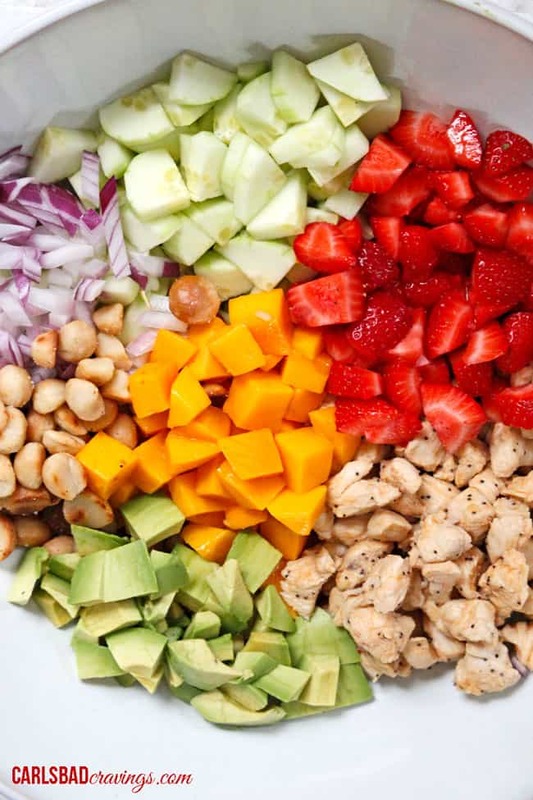 Mix together Poppy Seed Dressing/Marinade ingredients then add 3 tablespoons of the dressing (reserve the rest) along with chicken to large freezer bag and marinate for 1 hour up to overnight. Heat a dash of olive oil in a large skillet. Add chicken, season with 1/2 teaspoon salt and cook until no longer pink. 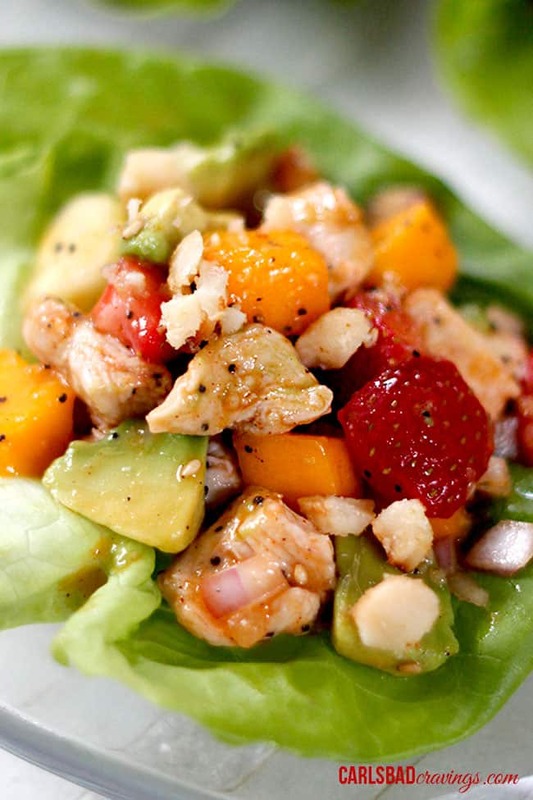 Combine cooked chicken, Fruit/Avocado Salad ingredients and reserved dressing to a large bowl, gently toss to combine. Chill for 1 hour up to overnight. (Optional) To toast coconut, spread coconut flakes in a single layer on a a baking sheet and bake at 350 degrees until just golden, about 5 minutes. Let cool completely. Meanwhile, dry roast macadamia nuts in large skillet over medium heat, tossing a few times until golden. 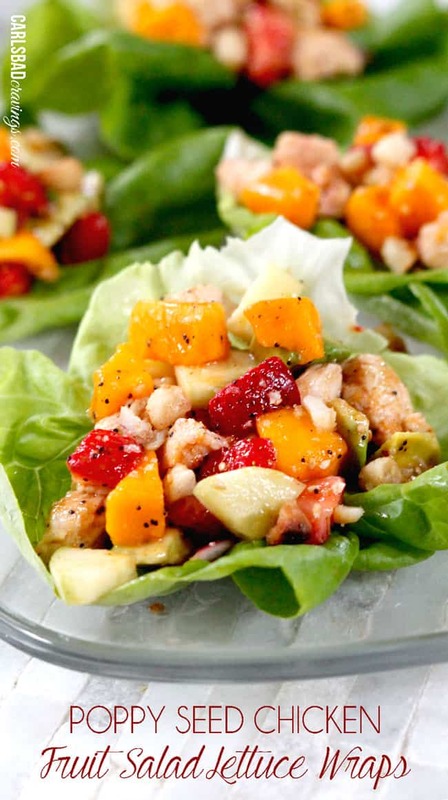 To assemble, spoon Poppyseed Chicken Fruit filling into butter lettuce leaves, allowing any excess dressing to drip off. Garnish with macadamia nuts and toasted coconut flakes. 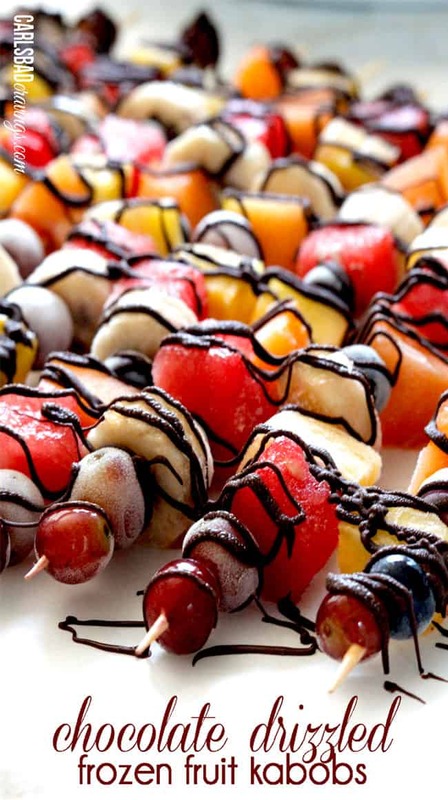 These look soooooo delish! Would love to try these!! 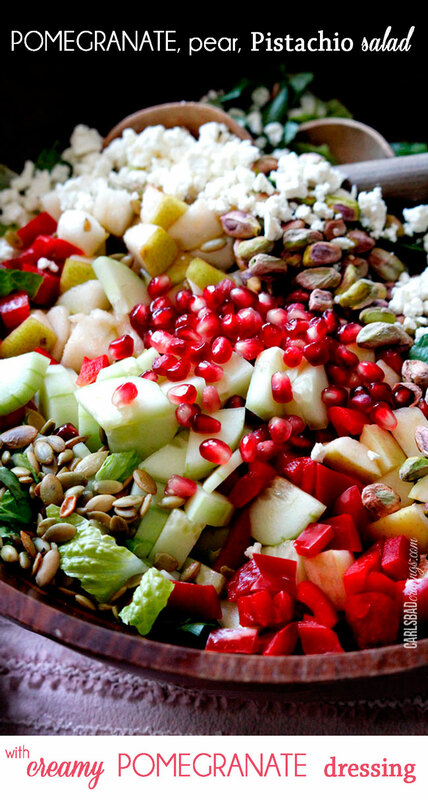 I LOVE poppy seed dressing! What a good idea to wrap it up in a lettuce leaf! Coconut and macadamia nuts sound like a great addition too. I love the fruit and chicken combo, especially with the lettuce. 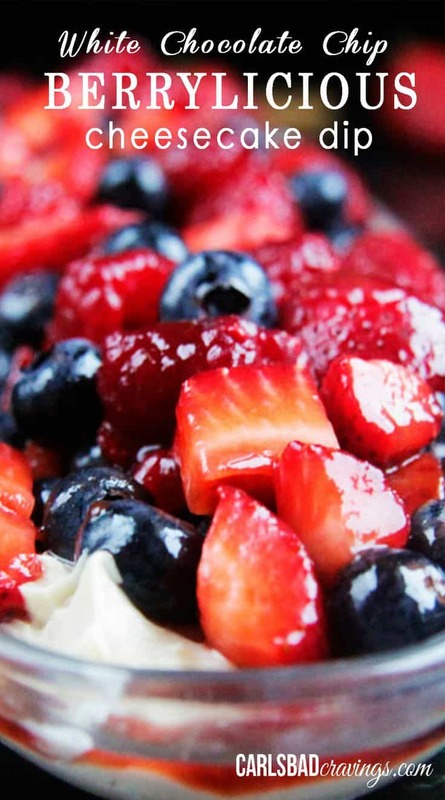 Such a wonderful recipe! These look so fresh and delicious! What a great lettuce wrap! These sound so flavorful Jen! I love lettuce wraps because I love cutting those carbs right down 🙂 Oh, and I will also eat straight from the fridge however I get yelled at for doing so by Grumpy. Ha! How do you keep the cut avocado from browning when you leave everything mixed overnight? Does the dressing keep it green? Thanks! Hi Melanie, great question! I have never had a problem with the avocado turning brown, I think it must be the lemon in the dressing, just be sure to cover the mixture with plastic wrap or a lid. Let me know ho it goes, I’m excited for you to try it! Can’t wait to try these. They look scrumptious! Thank you so much Janet! I think you will love them! Can’t wait to hear what you think!